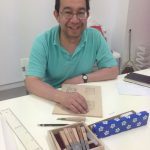 Center for the Science of Human Endeavor (CfSHE) and MI-LAB (Mokuhanga Innovation Laboratory Artist-in-Residence) offers an opportunity to learn mokuhanga (water-based woodblock printmaking) as well as related crafts and Japanese traditional arts. The programs are designed to enable international artists and not, to learn the fundamentals of mokuhanga and its related crafts within few days. The programs provide practical instruction as well as the introduction of theory and methods, knowledge about tools, and their history. We promise to the artists the encounters with new expressive methods, which we hope will contribute to their future practice. Some courses also provide the guidance of Ura-uchi (paper mounting) technique. Number of attendees is limited to 4, which allows instructor to support each participant’s study carefully. It means that at the end of the course Mokuhanga beginner will enjoy meeting and working on introductive Mokuhanga with its cultural backgroud, and Mokuhanga artists with experience will deepen their skill and find out solution to problems in their own study. The workshops will be led by Toshio Soyama or equivalent. *The program details/order may change by condition of the workshop. The participants will produce a multi-colored print in two or three colors. We will also provide information about mokuhanga suppliers, exhibitions and shops so that you can enjoy the wealth of culture and creativity in Tokyo. You can also order the working tools at a discounted price to get your own. The participants will produce a multi-colored print with a simple image. The instructor will support the participants to finish at least one complete Mokuhanga piece to learn the whole procedure. The workshop offers the closely entwined technique of paper mounting (Ura-uchi). Paper mounting enables better conservation and presentation of work on paper. Learning the technique also enriches the understanding of water-based printing and the characteristics of washi. *Participants can bring your own sketches/drawing on paper for mounting. Ura-uchi workshop lasts half a day. Makimono, the Japanese scroll is the oldest Japanese form of book made of paper, known as ones for letter or old narrative. Kakejiku, scroll of framed art, is also a type of Makimono. 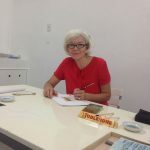 Learning this material will help you not only to feel close to the Japanese old culture and old people’s sensibility and attention to materials and tools, but to give some new inspiration to contemporary printmaking (and not) artists. Paper mounting (Ura-uchi) enables better conservation and presentation of work on paper. Learning the technique also enriches the understanding of water-based printing and the characteristics of washi. Beginners, artist, and all types of printmakers are welcome. Ori-Hon, Japanese folding book, was invented after Makimono folding the inside papers, making them in a shape of multiple panels and attaching hard cover pages. Now it is commonly used as Goshuin-cho, seal-collecting book for people at a pilgrimage to shrines. It can be made with almost any type of papers or fabrics as cover. Yotsume-Toji-Hon, Japanese four-holes bookbinding is old, but convenient, firm and ecologic method to make books. It can be learned just like sawing, and then you can enjoy decorating with thread on the cover. You can also make your book with preferred paper as cover. *The courses will take place with minimum of enrollments and applications are open by the indicated deadline or until it reaches the maximum enrollments. The classes listed below are all available for applying including those indicated with “confirmed” which have minimum enrollments but still have vacancies. 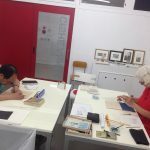 Express workshop 4-holes bookbinding – 1 day: 16,000 JPY + VAT 8% + PayPal handling fee 3.8% =17,936 JPY total *This workshop is designed only for beginners. The above prices include all the consumable materials and use of tools except some materials for Japanese scroll and Folding book Workshop. Extra materials will be informed at the reservation. These workshops will be held in Tokyo’s CfSHE Gallery at working hour 10 a.m. to 5 p.m. (lunch time: at 12 to 1 p.m.) each day. To apply for the course, please fill the form here (open application form in new tab). If you would need further information or just inquiry, please contact us by writing from contact form. Please also contact us for general information from contact form. Toshio became interested in American Pop Art and printmaking technique while working as a graphic designer. In 1977, he became a printer of Fuji Art Printmaking Studio and specialized lithography and copperplate printing. He established the Fuji Graphics Printmaking Workshop in 1983 and printed for a number of prominent artists both from Japan and abroad, by silkscreen, lithography and copperplate printing. In 1983, he printed Toshio Arimoto’s publication “Issen Ichibyou Monogatari” and mokuhanga prints. In 1988, he invited Chicago based artist Ghita Hardimon to organize a Viscosity Printing workshop. In 2017, he established FUJI PRINT ART LAB for printing, workshop, teaching and research. Yezid Vergara Gonzalez and Christine Dürr are participated in the workshop.